De Quervain's Tenosynovitis involves the thickening or inflammation of the fibrous sheath that surrounds the tendons at the side of the wrist where the thumb is located. The two tendons which are affected are extensor pollicis brevis (EPB) and abductor pollicis longus (APL). These two tendons travel side by side along the inside edge of the wrist on their way to the thumb through the first dorsal compartment of the wrist beneath the extensor retinaculum. They can be stressed with repetitive motions of the forearm involving pronation and supination, ulnar & radial deviation of the wrist and abduction/extension of the thumb (1). Individuals with de Quervain’s tenosynovitis often present with pain, tenderness and swelling at the base of the thumb at the region of the radius and wrist (1). Pain can also radiate proximally into the forearm and distally into the thumb (1). Other symptoms can include difficulty with movement of the thumb and wrist with activities such as grasping or pinching and crepitus (creaking sound) when moving the affected forearm, wrist or thumb (1). Repetitive activities requiring the hand and thumb such as lifting, office work, factory work, racquet sports, golf, texting, etc. may contribute to thickening and inflammation of the tenosynovium of the EPB & APL tendons. With inflammation, edema or swelling may occur in this area which may restrict the gliding action of the tendons within the extensor tunnel of the wrist. Other contributing factors for this condition can also include direct trauma or injury to the area or rheumatoid arthritis. 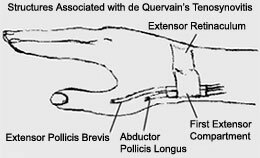 Individuals with de Quervain’s Tenosynovits will usually present with pain, tenderness, and edema at the base of the thumb. They may also present with decreased abduction range of motion of the carpometacarpal joint of the thumb, palpable thickening of the extensor sheath and of the tendons distal to the extensor tunnel, and crepitus of tendons moving through the extensor sheath (1). Finkelstein’s test is also frequently utilized to assist with diagnosing this condition. This test involves having the patient bending his or her thumb into the palm and grasping the thumb by making a fist with the remaining fingers. With the patient grasping on to his or her thumb, passive ulnar deviation of the wrist is then performed. A positive test will result in pain over the styloid process of the wrist with the ulnar deviation motion (1). 1) Anderson M & Tichenor CJ. A Patient with de Quervain's Tenosynovitis: A Case Report Using an Australian Approach to Manual Therapy. Physical Therapy. 1994;74(4):314-326.